National Development Bank PLC concluded the financial year 2018 on a high note, with exceptional results reported on all fronts, the bank said in a statement yesterday. 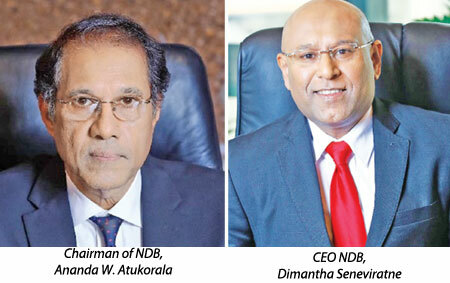 Reflecting on the year passed, the Group Chief Executive Officer of NDB, Dimantha Seneviratne said that the performance of NDB in 2018 is affirmation of the Bank’s transition from a mid-sized player to a bank of a higher league, with greater capacity, firmer resolve and power to perform. NDB recorded the highest level of profitability in its 40 years of history, from its ordinary course of business. This is affirmed with a 44% increase in core banking profit to Rs. 9.1 billion. The operating profit before taxes on financial services increased by 29% to Rs. 9.8 billion. Profit after taxes, including the newly introduced Debt Repayment Levy, was Rs. 5.7 billion - an impressive increase of 30% over the prior year. Profit attributable to shareholders, which includes profits from subsidiary companies, crossed Rs. 5 billion for the first time, to reach Rs. 5.3 billion, positioning the NDB Group in a new league compared to its peers. NDB recorded 23% growth in balance sheet with a total asset base of Rs. 473 billion, a quantum increase of Rs. 90 billion. The total asset base at the Group level was Rs 479 billion. The growth in the asset base was mainly due to an equally impressive growth in the loans and advances to customers. Gross Loans stood at Rs 353 billion as of the year end, a 27% growth and a quantum growth of Rs 75 billion. This compares well with a quantum loan growth of Rs 45 billion recorded in 2017. This expansion in the loan book is commendable, given the many internal as well as external challenges which affected the economy during the year. To The steady growth in business and prospects of becoming a domestic systemically important bank [D-SIB] coupled with industry developments such as BASEL III guidelines, impact of the adoption of SLFRS 9, capital conservation buffer, Debt Repayment Levy, etc., require additional capital for the Bank. In response to this demand for additional capital, the Bank concludeda Rights Issue during the last quarter of 2018, resulting in LKR 3.4 bn being raised as Tier I capital. Furthermore, in December 2018 the Bank also announced its plans to raise Tier II capital via a five year listed debenture issue, to support the business growth. The impressive financial results led to enhanced investor ratios. Return on equity [ROE] at the Bank level was 17.78% [2017 – 16.27%], whilst the ROE of the NDB Group was 14.61% [2017 – 11.09%]. The Bank Earnings per Share improved to LKR 30.92 from LKR 24.52 in 2017. The net book value per share at the Group level was LKR 185.63 whilst same at the Bank level was LKR 166.94.